This lesson will introduce some key ScreenSteps concepts to you. Understanding these terms will help you get the most out of ScreenSteps. ScreenSteps is a somewhat "opinionated" application. It really is designed for doing a very different type of documentation than what you may be used to. While you can use ScreenSteps any way that you would like, following the tips in this lesson will make your lessons more readable and easier to update in the future. 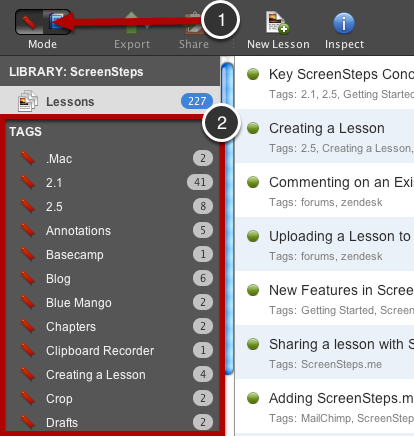 All lessons in ScreenSteps are stored in a Library file. A library is just a collection of ScreenSteps lessons. There is no organization to it. You can't output a PDF or HTML version of your entire library. All it does is automatically save your lessons so that you don't have to decide where to save them on your hard drive. You can create as many libraries as you would like or just one. 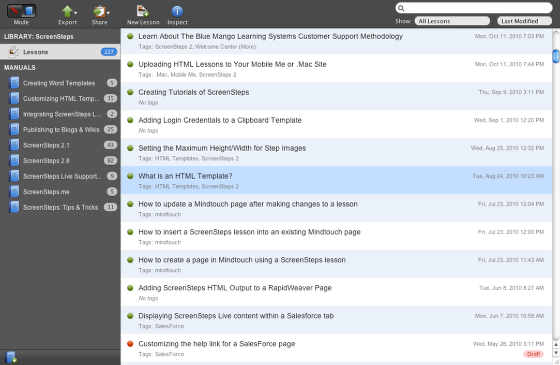 A Lesson is a single document in ScreenSteps. 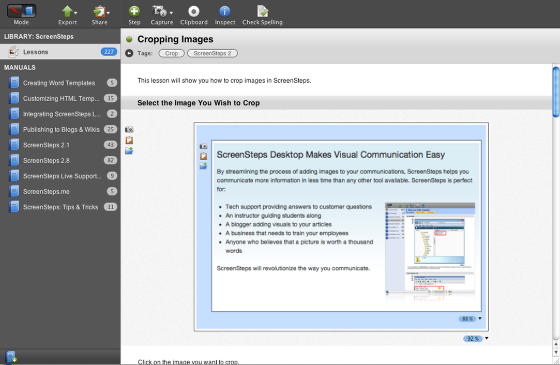 It can be exported to any format that ScreenSteps supports, such as HTML, PDF or ScreenSteps Live. A typical lesson should be between 3 and 20 steps. Occasionally you might write a lesson that is longer than this, but that should be the exception, not the rule. Lessons that are longer become laborious to read as well as update. 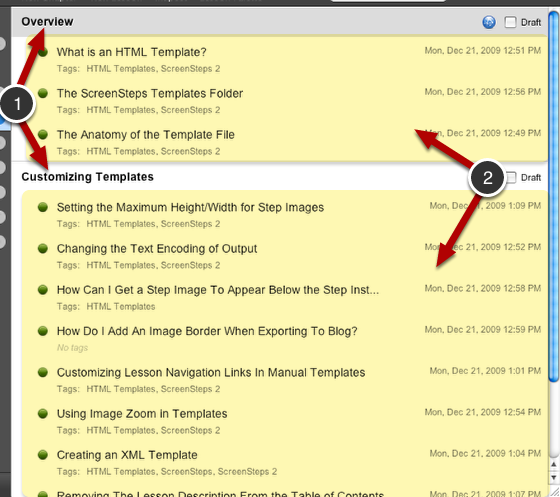 Most ScreenSteps lessons should focus around completing a single task. An example might be “Adding a Table of Contents”. The more focused the title the better the resulting lesson. Lessons such as “Configuring Application Preferences” generally become tougher to write in ScreenSteps because they are somewhat vague. 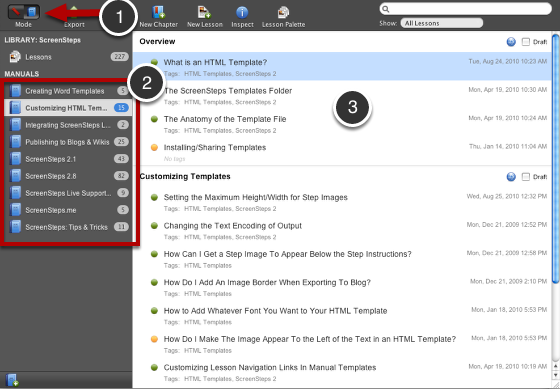 ScreenSteps works much better if you are creating a lesson titled “Setting The Default Output Folder in Preferences”. The action is more concrete and lends itself to a step by step guide approach which is exactly what a ScreenSteps lesson is geared for. You will write many more lessons. Your lessons will be much shorter. Your lessons will be much easier to write. Your lessons will be much easier to update. Your lessons will be much easier to read. Tags are simply a tool for organizing and finding your lessons in your library. You can't export a tag as a PDF or HTML file. Think of tags as basically categories for lessons that you create. A lesson can have as many tags as you would like. You must be in "Tags Mode" (1) to view a list of the tags in your program. As you add tags to your lesson they will show up in the Tags list (2). Manuals are created from multiple ScreenSteps lessons. Use a Manual to organize all of your (hopefully short) ScreenSteps lessons and then export them as a PDF, HTML or Word files complete with a table of contents (manual export is only available in ScreenSteps Pro). Manuals can also be exported to ScreenSteps Live. You must be in "Manuals mode" (1) to view manuals that you have created (2). When you select a Manual, it is displayed on the right (3). A Manual contains two types of elements, Chapters (1) and Lessons (2). Chapters are just groupings of lessons. Nothing more. You can give a chapter a title but that is it. The chapter title will be displayed in the table of contents. Lessons are just the lessons from your library that you have added to the manual. To add a lesson to a manual it must be in your library. The final concept for this lesson is that of a Package. A package is simply a means of moving ScreenSteps lessons and manuals between libraries or backing up a lesson or manual to a single file. You can export a single lesson or a full manual (pro only) as a package. Packages are the method you should use to share ScreenSteps lessons with other users of ScreenSteps if you want them to be able to edit those lessons. How do I move a lesson out of a "manual" and into the "lesson" library? @Scott - Anything that is in a manual will automatically be in your Lesson Library so you don't need to move it at all. You can't have a lesson that is in a manual and not in the Lesson Library. @Scott: All lessons in your library appear under "Lessons" so the lesson will already appear there. When you remove a lesson from a manual you are asked whether or not you want to permanently remove it from the library. Unless you specifically check the box saying you do then the lesson will remain in the library.